I was spinning with Ravelry friends in Sweden last weekend. It was absolutely wonderful! 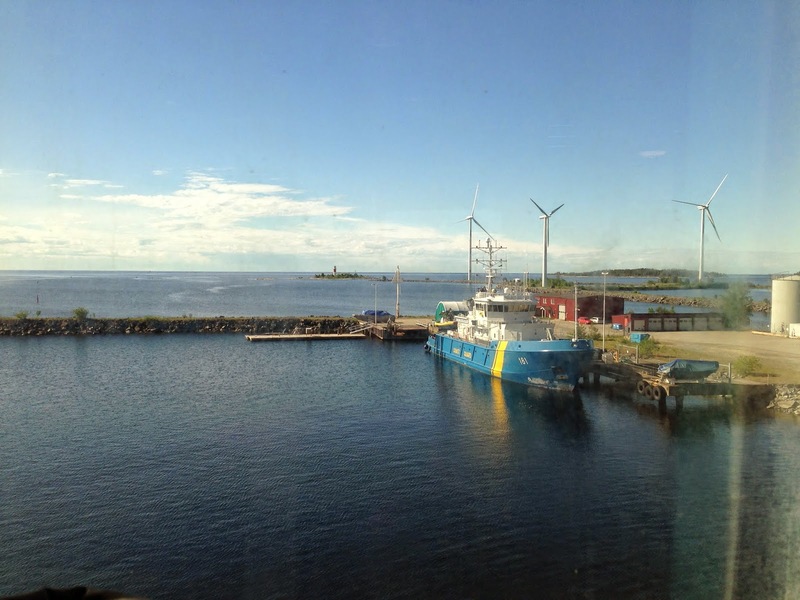 I took the old new ferry from Vaasa across the Gulf of Bothnia to Umeå, and it was so fun! 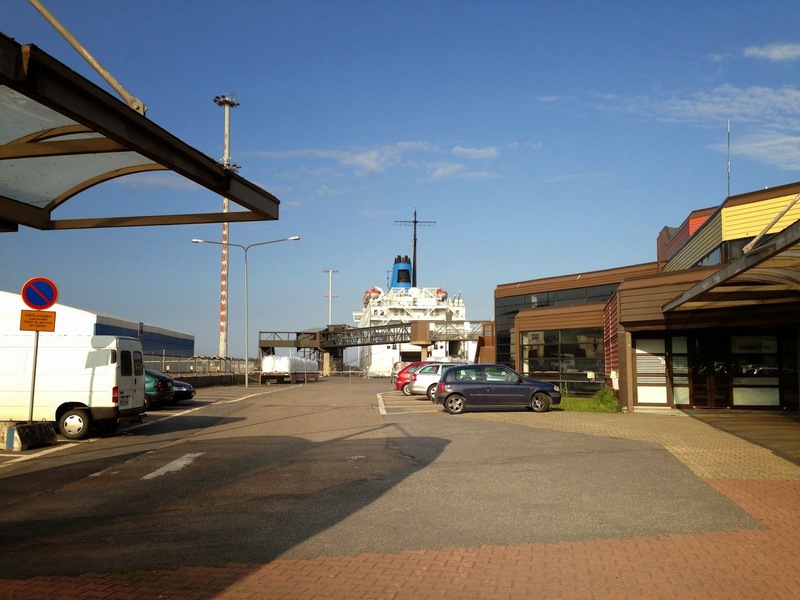 In the 80s we took the ferry ever so often, but when Finland and Sweden joined the EU the ferry was sold because new tax rules and higher ticket prices forced people to stop traveling so often. 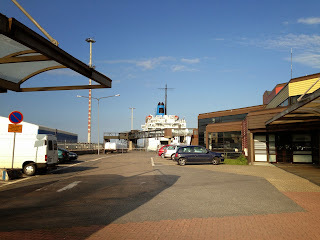 She has sailed somewhere in southern Europe until this spring, when she came home and was repaired and put back in traffic. There is no tax free onboard, but it doesn't matter. 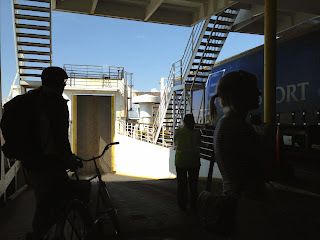 The important thing is to be able to travel cheap across the Gulf, and so far it is cheap. I met the most exciting travel companion on the boat. He saw me reading an English magazine and so we started talking in English. He was an Englishman living in Finland since many years, and it appeared that he was researching - now sit down, hold on to your chair and take a deep breath: work songs, like spinning songs! The four hours to Umeå felt like four minutes :) You can see him leaning on his bike in the photo above. Have you ever seen a beginner's yarn like this? I haven't. We were invited by Lillemor (Ravelry name zassh) of Limmo-design. 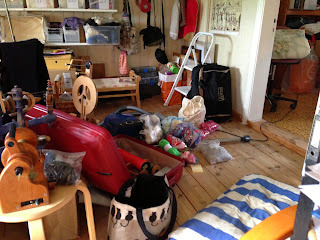 She kindly opened her studio in Vännäs to us, and the neighbor's studio also. When everybody had arrived and spread their tools, the rooms where crammed with spinning wheels, wool combs, hand carders, drum carders, spindles, people, and a funny cat that came several times a day to talk to us and beg for hugs. One theme was wool from a Swedish landrace, Värmlandsfår. We took a closer look at how you can prepare three samples of the double coated Värmland: combing and carding. At home we can do proper studies of how the different preps can be spun, and what kinds of yarn you get. The other theme was a bouclé yarn where the looping ply was spun from mohair sold by Ingrid (Ravelry name Melica), Mina Getter och Kaniner. It's a great joy to see hand combed mohair turn into perfectly circular loops! There was much talking, much laughter, good food, delicious strong coffee just as black and thick as I want it, lots of fibers and yarns to explore in Lillemor's shop. For some reason I had figured I could manage with a big suitcase (I had lots of equipment with me) and backpack, but guess what - I didn't. Parcels will arrive in due time from Lillemor and Ingrid. It was warm, almost hot, sunny and lovely. I think we all had a great time. I saw lots of animals, will show you in another post very soon. Wasa Express leaving Umeå, and the weather is still warm, sunny and no wind!